It is well known to hockey fans nowadays that the "goon" is no longer a vital part in hockey. Everyone who plays in the NHL is skilled and can contribute both offensively and defensively. No longer are there athletes who are just out on the ice to fight like there were in the 1970's-early 2000's. The era of the "goon" is dead. However, in the 2011 hockey film Goon, the spirit of the fighter is alive and well. Doug Glatt (Seann Williams Scott) is a normal hockey fan who is a bouncer at his hometown Massachusetts bar. He, along with his scrawny, mouthy friend Pat (Jay Baruchel) take in a local hockey game at what can best be described as a beer league. One of the players, upset at Pat's heckling from the stands, jumps over the penalty box and initiates a fight with the duo. What he does not know is that Doug "The Thug" Glatt is one of the toughest men in the city. A few punches later, Doug Glatt is eyed by the hometown team's coach and through a series of connections is invited to join their squad, serving as an enforcer, aka "goon". Throughout the year, Glatt learns how to skate, how to play hockey and most importantly, who he is as he becomes one of the most feared players in the game of minor league hockey. What makes Glatt a loveable character is how genuinely nice he is in what can be a cutthroat sport, as depicted throughout the film once he joins the Halifax Highlanders. He is sweet, sincere and willing to do anything for the team to earn a victory. While with Halifax, talented winger Xavier LaFlemme is in a flunk after suffering a massive concussion from a hit by legendary enforcer and icon, Ross "The Boss" Rhea. Glatt's one responsibility while with Halifax is to protect the French-Canadian and get his game back up to par. As one can assume, there is some tension between the two polar opposite personalities. This is a story about overcoming preconceived notions and making a name for oneself, even after being dubbed worthless. Glatt is a sympathetic character that one can rally behind and ends the viewing experience of Goon feeling genuinely proud of his achievements. As a hockey fan, the film encompasses the ups and downs a team may face and the different personalities than one encounters in their career. Glatt is actually inspirational, despite his chosen vocation. The story is well done, the writing is a bit simple, but I don't think Goon was meant to be taken as a deeply moving and philosophical movie. The acting leaves a tad bit more to be desired and the sudden ending leaves me wanting more, but I can honestly say that this is one of the best hockey films made, period. 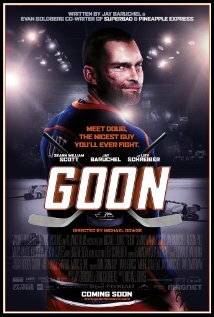 If you're in the mood for good comedy, great action, and a touch of romance, you better check out Goon, eh.